Semi trucks are large vehicles that require a significant amount of skill and training to drive. One wrong move can lead to dire consequences. Unfortunately, that was the case for a Florida truck driver. The 32-year-old Ocala man was killed in a truck accident on the morning of December 14. The fatal crash happened on I-95 near Crosstown Parkway in Port St. Lucie. The driver lost control for unknown reasons and went off the road. The truck then hit an exit sign, rolled over and caught fire. The driver died in the accident. The southbound lanes of I-95 were closed as crews investigated. A semi truck can weigh as much as 80,000 pounds. A typical passenger vehicle is just 4,000 pounds. Given this difference in weight, it is not uncommon for a truck accident to cause serious injuries or even death, especially to occupants of the smaller vehicle. Truck accidents can happen in a variety of ways. Most of these are caused by driver error. Truck drivers have a responsibility to drive safely on the roadways. Unfortunately, this does not always happen. People make mistakes. Some drive while they are fatigued or tired. Some drink and drive. Others drive too fast or are distracted. However, keep in mind that more than 80 percent of truck accidents are caused by the driver of the passenger vehicle, not the truck driver. Many drivers cause accidents by following too closely, staying in a truck’s blind spots and cutting off truck drivers. Trucks cannot slow down as quickly as other vehicles. They are bigger and heavier, which causes them to take longer to brake. Poor weather can also lead to truck accidents. Ice, rain and snow can cause problems for truck drivers. Trucks cannot slow down quickly, so going too fast in these conditions can lead to skidding and hydroplaning. Failure to maintain the truck can also cause crashes. Semi trucks travel thousands of miles a day. These vehicles go through a lot of wear and tear. Worn brake pads and bald tires can lead to serious accidents. This means that truck drivers and trucking companies have a responsibility to check trucks daily. Otherwise, a fatal accident can occur. Cargo loading issues can also cause crashes. If the cargo is not properly secured, it can cause the load to fall over or the truck to tip over. Mistakes during cargo loading can lead to serious consequences for the truck driver and other drivers on the roadway. Due to the size of the vehicles involved, truck accidents are often deadly. Those who survive often must deal with long-term injuries. 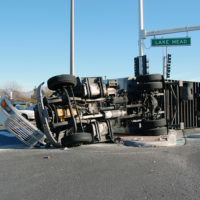 A truck crash can lead to numerous damages. If you or a loved one was injured or killed in a truck accident, seek legal help right away. The Dade City personal injury attorneys at Mander Law Group can assess your case and determine your rights to compensation. Schedule a free consultation by calling (800) 557-0411.